Finding Nemo: Nemo's Ocean Discoveries. Aladdin: Aladdin's Wonders of the World. Winnie The Pooh: The Honey Hunt. Toy Story 2: Operation Rescue Woody. Alphabet Park Adventure X 2. Cars: Rev it Up in Radiator Springs. Works with V.Smile Learning System. Alphabet Park Adventure. Cranium ~ Partyland Park. Nihao, kai-lan Happy Chinese New Year! Dora's Fix-it Adventure. Toy Story 3. Partyland Party. Toy Story 2. Alphabet Park. Alphabet park. Go Diego Go. Great condition for its age and use. All in great Preowned Condition. Mobigo Disney. King Fu Panda. 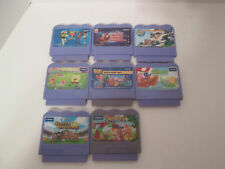 All 5 games are pre owned but in overall good condition. Please message me regarding any questions. Thank you. 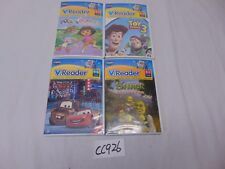 VTECH VSmile 5 Game Lot Learning Cartridges Batman, Toy Story 2, Cars, Thomas..
VTech V Smile 4 Game LOT - Toy Story 2 , Cars , SCOOBY-DOO! , Zayzoo !!!!! Scooby Doo, Toy Story, Dora, Blue's Clues, Sponge Bob etc. They are all untested, but look to be in good condition. -Care Bears: A Lesson in Caring. -Toy Story 2 Operation: Rescue Woody. -V.Smile Art Studio. Disney Finding Nemo Nemo's Ocean Discoveries (a little discolored). - Scooby Doo! Funland Frenzy. - Superman The Greatest Hero. 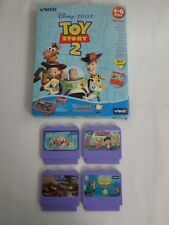 - Disney Toy Story 2 Operation: Rescue Woody. - Alphabet Park Adventure. Elmo’s Big Discoveries. Dora the Explorer Dora’s Fix-it Adventure. 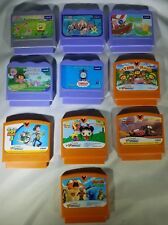 Lot of 11 Vtech games . Please view photos closely to judge the condition for yourself and feel free to ask any questions you may have. THANKS FOR LOOKING!